Trait: Musical Masterpiece: Kayla can easily play any instrument she gets a hold of, even if she's never played it before. Appearance: Kayla is a young, pretty, pink-haired female with black-and-red eyes. Kayla's hair is put in a ponytail. 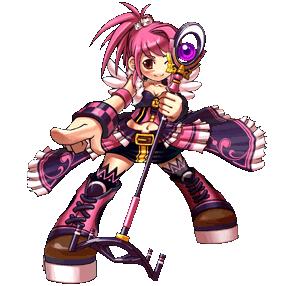 Her outfit was provided by her company, which is mostly pink and black-blue, and includes a small shirt, wristbands, a short skirt, and boots. She has small wings that are only part of her outfit and don't grant flight. Her hairpiece is also two cat heads. She is 5 foot 6 inches tall with a skinny body. Personality: Kayla is one who is nonchalant about things, provided they don't aggrivate her. She likes to brag and show off. Kayla, despite this, is usually cheerful and spunky. Affinities: Kayla is a musician that is great with music. She is one with above-average stamina and an above-average magic defense. Weakness: Kayla is one people can call annoying. Her physical defense is also below-average. Then the Heartless attacked. During a concert at Radiant Garden, Heartless showed up. Kayla and a couple others got out okay, but Kayla learned that the company had to disband. People were afraid those with the group were attracting the Heartless. This got Kayla upset. She wandered Radiant Garden afterwards, determined to get back in the music career one way or another. Approved. Welcome to the site. Correction: it appears I've made an error. I divided sound up into two elements actually, because wind and space cover its properties respectively. So, you can actually remove sound (because its covered with your space element) and add another.